I had the opportunity to review MONAT AnyWhere Hair set from Kirkendall Effectt. I received some samples of shampoo, conditioner, dry shampoo, and REJUVENIQUE intensive oil, along with instructions on how to use them. I have blonde hair that hangs half way down my back. For the last couple years I haven't been very happy with the condition of my hair, which is probably my fault because I have used hair coloring on and off for years. My hair became dry, dull, brittle and lacks any kind of volume. First of all MONAT Dry Shampoo was my favorite. I know, out of what I received, that is the product I will be getting more of. I had not washed my hair in a couple days when I used the dry shampoo. It made my hair feel nice and clean. It looked shiny as if I had a hair washing that morning. I've used other dry shampoos and have not been impressed with the idea of dry shampoo until MONAT. I also followed the instructions with the other MONAT Haircare products and I've had the same satisfying experience. My hair looks great right now. Its full of shine and bounce. There was no greasiness involved with any of MONAT's hair products. I love that these products are natual, I won't use products that have all them dangerous toxins or are tested on animals. 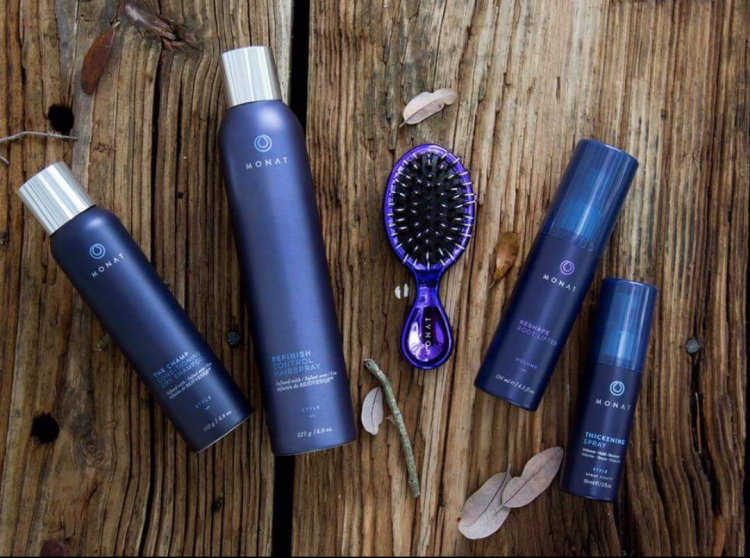 MONAT products contain key ingredients that focus on hair growth. Their Intense Repair helps stimulate the scalp and boost the natural growth of thicker and fuller looking hair while improving follicle strength. The ingredients in MONAT are naturally based, safe, pure and sustainable. The REJUVENIQE Oil Intensive is a blend of 13+ natural plant and essential oils rich in omega fatty acids, antioxidants and nutrients highly compatible with hair and skin. CAPIXYL is a part of MONAT's blend. It is an emollient blend that helps protect the scalp, thicken and strengthen the hair while supporting natural growth. MONAT does not add gluten to their formulas. There is also no harmful colors. They use safe colorants approved by the FDA, health Canada and the Europian Commission. There are no harmful fragrances as MONAT uses fragrances that are approved by the International Fragrance Association. There are also NO Parabens, Sulfates, Cyclic Silicones, BHT, DEA/MEA, Polyethylene Glycol, Phthalates, Phenoxylethanol, Petrolatum, Mineral Oil, Triclosan, Plastic Microbeads or Formaldehyde Releasers. There's is no testing of cosmetic products on animals, Nor is there any animal Origin Ingredients. MONAT uses vegan in material. I am definitely trying this out. Yes, please. I need more hair car sets like this. Off to check it out more. I love the brand name MONAT too, reminds me of art! I've heard some terrible things about Monat, like people losing their hair from it. I think some people are allergic to the ingredients, and like with any product used on the skin, it should be patch tested before regular use. This hair care looks like it is so awesome. I am always looking for something to help my hair. I have never tried a dry shampoo--I think I might like this one. My hair is also pretty damaged and unmanageable right now. Will look into this one more!! I would like to try this product. You said it could also helps stimulate hair growth, so this is a definite must have for the men in my family. I don't want to see my sons go bald early. Sadly, they have the gene for male pattern baldness. I'd love to try the intense repair. Looks like some nice products to use this summer. This looks like it could be really great for my hair.